Looking for fun music events in Mountain View to start off the fall with tons of chances to win prizes? Rascal Flatts are bringing “Flatts Fest” to the Mountain View Shoreline Amphitheater on Friday, September 16th at 7pm. Pre-show activities include a karaoke challenge, wedding chapel, scavenger hunt and more. There will also be carnival food and games, along with many opportunities to win prizes from Firefly Sweet Tea Vodka, Matthews Bows and more. Local Bands looking to make their big break can sing their hearts out at the “Flatts Fest” Karaoke Challenge. The winner of the challenge has a chance to open for one of Rascal Flatt’s 2012 stops based on his or her hometown in the Mountain View area, and a trip to the Smoky Mountains to record their own CD. Fans looking to enter can either listen to their local radio station or arrive early on show day to perform and win. One lucky radio listen er couple will say their “I dos” before Rascal Flatts plays at the “Why Wait Chapel.” Afterwards, they will meet Rascal Flatts backstage and entered in a drawing to win a honeymoon trip to Las Vegas. Not interested in getting married? Not to worry, there will be plenty of prizes from the video shoot and drawings for wedding prizes. More prizes are available by participating in the “Flatts Fest” Scavenger Hunt. Guests can use the free wi-fi available to check in via the Rascal Flatts website to receive a checklist. Then they can search for the scavenger hunt signs and scan the code to receive a surprise. Everyone who checks in has a chance to spin the “Flatts Fest” Prize Wheel before the show starts. Those who are chosen to spin receive a text with when and where to meet. 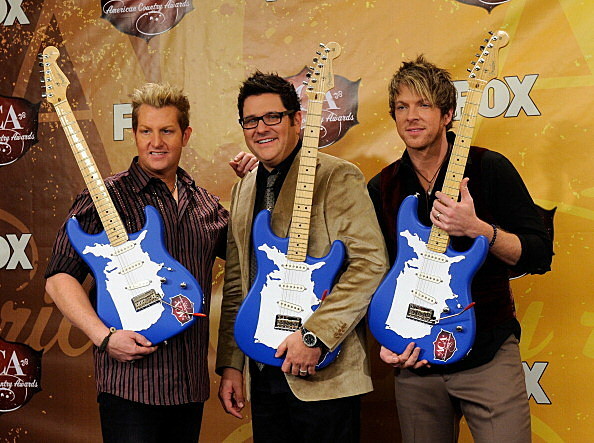 They will spin to win big prizes like autographed guitar or a birthday call from Rascal Flatts! Fans can also check out the “Flatts Fest” Fan Zone and explore the Rascal Flatts museum. Life-size cut-outs of the band will be available for photo ops, as well as screens playing Rascal Flatts’ music videos. Here, fans have the chance to record a video question that may be chosen to be answered on the big screen during the show. “Flatts Fest” will feature opening acts Sara Evans and Justin Moore. Previous PostMountain View Art & Wine Festival September 10-11Next PostEat, Drink and Be Merry at Campbells Oktoberfest!